I have been working on a theme that could match three great memes: Mellow Yellow Monday, Music Monday and Today's Flowers. 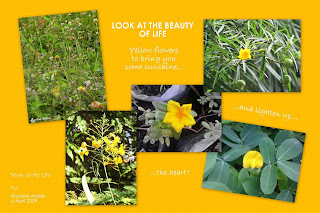 I hope you don't mind and will enjoy the collage of yellow flowers from my photo archives, while listening to Life is a Flower by Ace of Base. Have a beautiful week, everyone :)! Beautiful yellow flowers on a beautiful yellow background! PS, I think your link on MYM is broken. Great post ... I like the way you combine two memes!!! Rosidah! I missed the chop here sweetie! Happy MM to you! You know, I almost picked an Ace of Base song too this week lol! Love your slideshow blooms and song! Nice multitasking! And a very cool collage. Beautiful flowers and I enjoyed the musical video. Thank you for sharing and have a great week. Love the collage, beautiful flowers! TODAY'S FLOWERS thank your for participate!